This year I’ve picked up both Year 9 HASS classes at my small site. The second depth study – Making a Nation – promised to be mind numbingly dull to deliver, with its focus on early Australian history and that thrilling topic ‘Federation’. I vaguely remember memorising mnemonics regarding the reasons for Federation during my 90’s high school career and entered into the topic with a heavy heart. However I have to commend the Australian Curriculum in this area: the topic is now filled with enough blood and controversy to keep my middle schooler audience happy. Why didn’t we study Indigenous resistance fighters when I was in high school, I ask? Afghan cameleers in the outback are fascinating. Sure, the usual list of ‘key [white male] players’ is required to be covered and the events leading up to Federation (snore) but at least there’s some good stuff out there. In fact there’s enough out there in the internet ether that I haven’t needed to resort to developing many resources myself. This page will collect the best of what I’ve found. Australian students cover first contact, exploration, settlement, convicts and the Gold Rush in primary school years (from Year 4 onwards). Many resources available online target this age group and are simplistic. Although Year 9s cover similar territory, I felt the focus should be more on exploring bias, differing viewpoints and controversies. Another suggestion: avoid resources which describe Europeans ‘discovering’ Australia. These are outdated. History Wars: In early 2016, right-wing newspaper The Daily Telegraph attacked University of New South Wales’ guideline which recommended that education students to not refer to Europeans as the ‘discoverers’ of Australia, but rather as ‘invaders’. The frontpage article was widely ridiculed and led to articles around the world regarding Australia’s ‘history wars’. The conversation – around the article formed the basis for a great lesson and conversation. – ‘Why Australia lies to itself about its Indigenous history’ from Sydney Morning Herald, including a video of discussion on Sunrise. This one sided discussion inspired anger, especially from Indigenous actor Thelma Plum. – ABC News article regarding the controversy and a similar article from SBS. These are useful because they are not locked behind paywalls. – The Australian’s article regarding the controversy. This article is notably different from others in that it is supportive of the Daily Telegraph. – Mammamia article which provides a reasoned outline of the issues around refering to Australia as being ‘discovered’ and not ‘invaded’. Notably, it also includes a link to Stan Grant’s riveting Australia Day speech. – Stan Grant himself weighed in by suggesting that universities shouldn’t tell students how to think. – Junkee article regarding the Daily Telegraph article which pokes fun. – The UNSW Terminology guide in question and the Daily Telegraph article can be sourced here (note: swearing). – Article from The Conversation UK which covers the historical inaccuracies of the Daily Telegraph article. Yagan: My students really engaged with the story of Noongar warrior and leader Yagan, who fought back against settlers in his homeland. His story would make a great film as it features misunderstandings, betrayal and loss. ABC commissioned a great documentary – Yagan (2013) – which tells parallel stories of Yagan’s life (through gritty recreations) and his family’s bid to have his head returned from England, where it had been sent 160 years ago as a ‘souvenir’. We watched the documentary on Clickview (which I don’t recommend – it was frustratingly jumpy and fuzzy), but a DVD can be purchased from The Education Shop. ATOM has a study guide for purchase here. Changing map of Australia: I used this Wikipedia page to quickly throw together a worksheet where students had to cut / paste each map with its matching description. Took 20 minutes and isn’t too difficult. Gets kids reading and reasoning. Why Federate? I found this semi-roleplaying activity on TES and I’m going to give it a go tomorrow. Basically, the resource includes a series of roleplaying cards representing each colony. Students work through a series of questions and then report back to the class about whether their colony would vote for Federation or not. I’ll be using it as an intro to the reasons for Federation. Today is the 10th Anniversary of September 11; it’s a cliche to say it but man I can’t believe it’s been 10 years already. When I first started teaching, September 11 was relatively recent and my students knew enough to discuss it in depth. Now most of my students were only four or five when it happened (and soon they wouldn’t have even been born) and 2001 is almost ancient history to them. Kind of like when I was a kid learning about the fall of the Berlin Wall. With my year 10s this year I did an English unit with a War on Terror theme. September 11 may be a long time ago for these kids but the War in Afghanistan is very real and recent (Christ, just had a thought: this means the War in Afghanistan has been going on for 9-10 years too. Bugger.) Anyway, I developed these worksheets as an introduction to 9/11. When I’ve put it together, I’ll post that unit of work as well. Also this year I have been reading Tomorrow When The War Began with my year 9’s. Being a story about an invasion of Australia, there is a link to September 11, Pearl Harbor and the Bombing of Darwin as these are all incursions on First World countries that otherwise go unharmed. A crossword with vocabulary related to the War on Terror. Two articles explaining the basics of September 11 in common kid-friendly language. One is from a News Limited article (circa when Osama Bin Laden was caught and killed) and a Behind The News transcript (a kid-orientated news service run by the Australian Broadcasting Corp.) Take your pick. There is also a notetaking form; I suggest you update the comprehension questions in the bottom box. Instruct students to read through and circle unfamiliar words; or at least words they don’t understand. They copy these into the first table. Students then read through and highlight the key words and phrases. They copy these into the second table and explain them. Then students answer the comprehension questions. These do need updating and I suggest you change them. I also adapted the same articles for my year 8s as a cloze rather than a notetaking activity. The plan is to stream the BTN news story so they can get the answers. 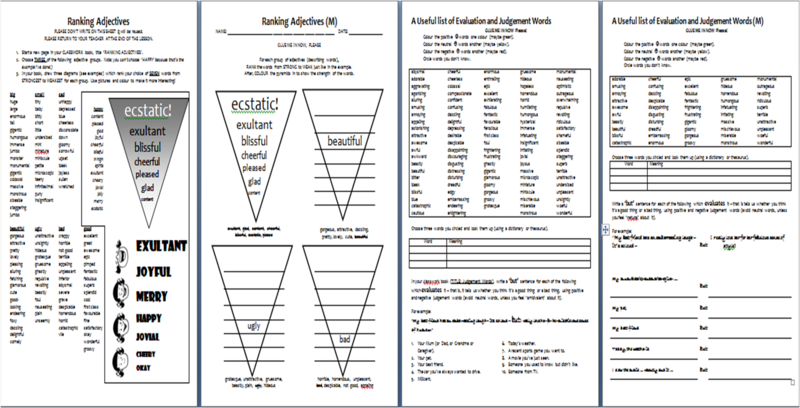 A couple of worksheets which focus on using adjectives for judgement or evaluation. Students rank adjectives according to strength in one and then colour according to negative and positive connotation on the other. Both include a ‘Modified’ version (marked ‘M’) for students with lower ability. 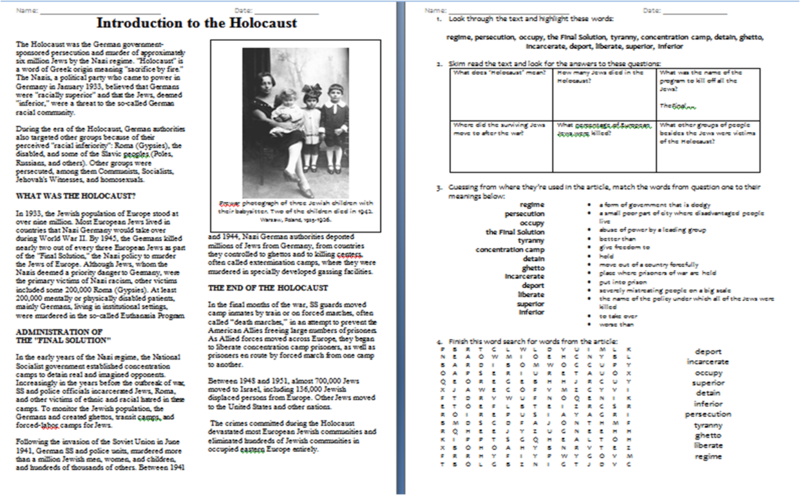 A basic reading comprehension worksheet introducing the Holocaust. It was used as part of a unit on The Boy In The Striped Pyjamas. It includes a short article, some comprehension activities and word search.